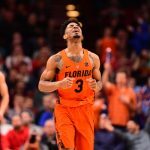 Florida Gators basketball (10-4, 2-0 SEC) has now won four straight games — after dropping four in a five-game stretch — following a dominant 83-66 victory over the No. 11 Texas A&M Aggies (11-3, 0-2 SEC) on the road Tuesday night in College Station, Texas. The Gators took down the Aggies behind one of the hottest shooting nights of Florida’s season to this point. It was over when … Florida took a 16-point lead into halftime but saw Texas A&M claw back early in the second half, cutting its deficit to 10. It did not take long for the Gators to bounce back, however, with an 18-5 scoring stretch that gave them a game-high 23-point lead with 6:25 to play. UF took its foot off the gas at that point but never saw its lead fall below 16 points. 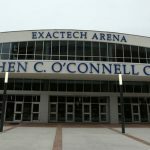 Exceptional efforts: Graduate transfer guard Egor Koulechov got back into the swing of things after a string of poor shooting performances, draining 5-of-6 threes on the way to a game-high 19 points. Sophomore forward Keith Stone hit 4-of-6 triples to post 18 points, and redshirt junior G Jalen Hudson dropped in 3-of-4 treys for 11 points. Senior point guard Chris Chiozza remained efficient with 12 points and nine assists to just two turnovers. 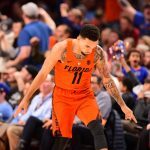 What it means: It has been quite obvious for weeks now, but the Gators win when they are able to put the ball in the basket with at least decent efficiency. 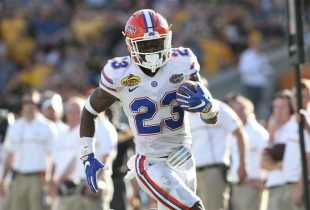 After a hot start to the season, Florida cooled off quicker than any team in the nation, going from a top-five team to unranked in a two-week span. It looked like UF was going to again blow a double-digit lead in the second half, but the team deserves a lot of credit for persevering and maintaining its advantage through the finish. Perhaps this can be a lesson learned for the rest of the season. Up next: UF will remain on the road when it faces Missouri on Saturday at 1 p.m. in the Gators’ first SEC on CBS game of the season.